A compilation thread for Tsukitei (Yamasaki) Hōsei's stuff outside Gaki no Tsukai, enjoy! Please do share here if you find anything new or old! Anyone is free to contribute content to this thread and it's greatly appreciated, thank you! Also any comments that don't include links to content are very welcome in the Discussion off-shoot thread, feel free to drop by! In This Post: Notes + What's Missing, Links, Youtube playlists of songs + highlights. 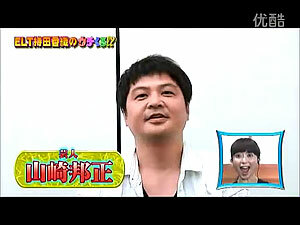 SUBBED: VS Arashi 2012.07.05 & 2011.07.07 (Variety), Hello! Morning (Variety), Cocorico Million Kazoku Special (Challenge) (all in the Past Work Compilation). Everything else RAW. Though if you don't mind inaccuracies, you can find "Amateur Sub" GIFsets & clips on the YamasakiGIFs Tumblr. Most English titles are Google Translations so not accurate. You can download the videos on Youku, Pandora etc. using the methods listed here. No cast list for some episodes though e.g. the 27th so could be more. 1st Show (March 1, 2005). Got to the final round. Sung the following songs: "煙が目にしみる (Smoke Gets In Your Eyes)", "星屑のステージ (Stage of stardust)", "愛という名のもとに (In the name of love)" and "離したくはない (I do not want to let go)". 5th show (July 25, 2006). First round entry. Sung "WHITE CHRISTMAS (ホワイトクリスマス)". 11th show (March 04, 2008). First round entry. Sung "恋におちて -Fall in love-". 12th show (May 06, 2008). Got to the 3rd round. Sung "見上げてごらん夜の星を (See look up at the stars in the night (? 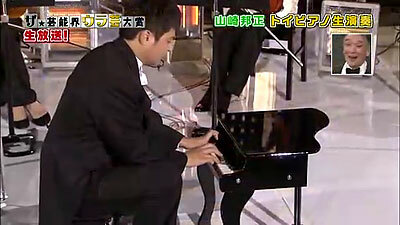 ))", "言葉にできない (I can not say)" and "時代 (Era)"
13th show (August 19, 2008). First round entry. Sung "三日月 (Crescent moon)". 20th show (August 23, 2011). First round entry. *Managed to find his song in this, but the full episode would be cool to see the pre/after talk & reactions. A show he's usually done a music performance or other act on each year, been unable to source earlier years e.g. 2007 and below. Family sitcom. Episodes 49 - 52, 59 - 70 and beyond Episode 75 if any. Broadcast between 1996 - 1997. Comedy skit show. Only the hospital phone one has been found. I assume most likely mid 90s around when he was doing the Shimura Family sitcom mentioned above. Annual variety show. It'd be great to find the 2002 and 2006 deluxe specials (オールスター感謝祭超豪華版) since the Wiki seems to mention some notable incidents with Yamasaki during the game challenges. But any years would be great to find before 2009. Variety talent acts judge show. Comedy show in a school setting which co-starred Jimmy Onishi. Any episodes. Ran between 1992.04.05 to 1994.03.27. A kids show he co-hosted. Any episodes would be great. He also may of done some music stuff for MTK (天才てれびくんMAX), only found Karma Chameleon. Early 90s late night variety show. Anything before Episode 5 or after Episode 15. 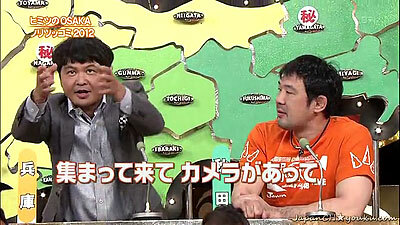 Batsu shows (the non-Special episodes without celebrities) 2011 & 2010. - Bullet Messe(?) (メッセ弾) variety show. - Early Ametoku (アメトーーク! ), I think between 2003 - 2005. Earlier years before 2011 assuming he's on it each year. Song parody show. There might be some other episodes he was on than the 4th, 5th and 9th. - Forbidden Love in Kyoto (?) 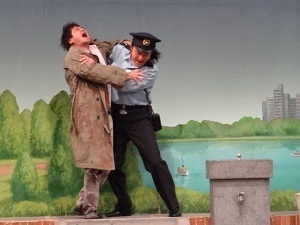 京都に秘められた禁断の愛 （Asahi Broadcasting） as a Policeman. YamasakiGIFs Tumblr - GIFs, photos, clips & more. Mostly from Comedian Karaoke King. Mostly from Monomane Battle & Monomane Grand Prix. NOTE: As always please do share if you find anything new or something from the Missing list at the top of the thread! Tsukitei Hosei search: Youtubeowaraitv, Varadoga, Owaraimovielink, Varientary. Either click on the heading or on the ≫続きを視聴する under each post summary to get to the video embeds / links. Stuff can also be found on the above sites by searching for 山崎邦正 (Yamasaki Hosei) but there is unlikely to be newer results due to name change. Last edited by soudou on 12.01.2015, 00:17, edited 60 times in total. 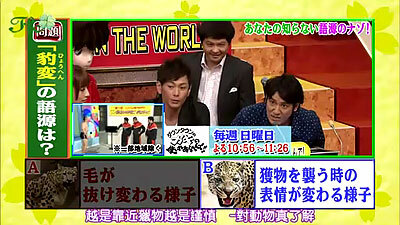 2013-02-02 - Yamasaki is the final guest (they play the Yamasaki Ichiban theme despite the name change). He and the host visit a shop where they have their auras photographed and compare the results between them. Then they go for a meal where they seem to get Yamasaki to do a wordplay challenge (lost without translation but the way they are being said seem funnily exaggerated and the faces are entertaining). Yamasaki also mentions a Yoshimoto stage play he's to be in which also stars Endo, titled: アンチ吉本・お笑いレボリューション. 2013-02-02 - Starts off with commenting on early photos of each of the guests including Yamasaki's young kendo photo. Various topics follow and a bit of trying out an exercise. Yamasaki also tells a story towards the end. Last edited by soudou on 03.08.2013, 22:54, edited 17 times in total. From about 2 minutes in, Yamasaki (Tsukitei) and others visit "元祖辛麺ゆうさん", a restaurant off the beaten track in Shinsaibashi, Osaka, to check out their spicy noodles. Gist of whats being said based on Google Translate of a transcript. 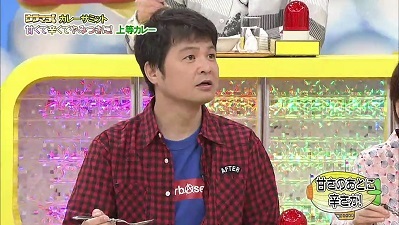 They discuss what tolerance they have for the strength of spicy foods, Jinnai, sitting next to Yamasaki, says he doesn't do spicy foods so he'd go for the lowest you can get, a 3. The lady running the restaurant says no way, you'd have to go somewhere else for that. Jinnai asks what he should pick then. The lady says 25. Yamasaki and the others are surprised and hesitant. Hakko asks what is the maximum, 150 she says. 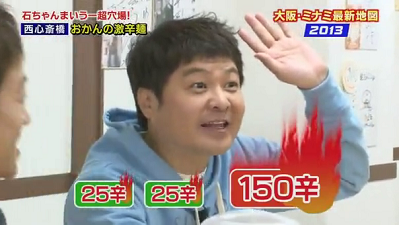 Ishizuka says they'll go for 25, Hakko says someone should go for 150. But Ishizuka says he's sticking with 25 and Jinnai quickly asks for 25 too. Yamasaki also asks for 25 and insists he even called ahead by phone to reserve for 25, the others aren't so sure he can do that so he eventually gets lumped with the 150 strength! The spice is dished out by spoon amounts rather than measured which they are surprised by. They are also impressed by the red colour. It's served with Korean noodles, egg and a (leek or chive?) soup etc. Jinnai says though he doesn't usually like spicy foods it is pretty delicious. The 150 strength spicy noodles is prepared. Yamasaki thinks it looks like an inferno and implores that it's going to be impossible for him to eat it. 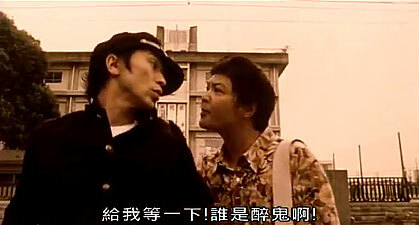 Jinnai insists that he eat it. After he tries it and his odd reaction. Hakko: What's happening to him? Jinnai: I guess it could be either way. Yamasaki (Tsukitei) visits "勝っちゃん", a restraurant offering all-you-can-eat grilled meat at a very cheap discount. With a choice of 57 foods including 26 menu items, BBQ beef, desserts and bibimbab (Korean rice dish). Yamasaki: Wow it's really juicy and delicious! The chef brings out a plate with tons of meat. Mr Mikami: You can eat all of this for 1,980 yen. Yamasaki wonders about if someone could possibly eat all of that without leaving and what kind of cost that would be to the restaurant. They run through the Best 3 on the menu. Yamasaki then stops, apologises and goes into Super Discount Hunter mode! Mr Mikami says that there is a further discount on weekdays only of 929 - 1,000 yen according to the amount you feel you can eat within a certain time. One of the hosts presenting some R-1 Grand Prix finalist comedy acts. GIFs of him messing with that picture. Topical talk show discussing various items from newspapers and other sources. He also posted a photo of some of his gifts from his daughters etc. Broadcasted stuff he was also on but could not be sourced online (mostly talk shows, so lost without subs, but if anyone can find the other Magic of Dining that could be interesting). NOTE: As always please do share if you find anything new or something from the Missing lists! Last edited by soudou on 20.03.2013, 21:40, edited 6 times in total. So I found the February episode of Marco Polori Wide that Yamasaki was on and was going to just add it to the previous post but it turned out that this episode is quite different to the norm (he's a semi-regular on the show as one of the gallery of people). However in this episode the roaming reporters do a surprise interview with Yamasaki and they pose to him some seemingly awkward questions. Endo is also in this episode as one of the gallery. It'd be awesome if anyone can tell what's being said in this one! The first part is talk with the guests. 16mins in is a moment where Yamasaki seems to fumble his words and Endo has a "cold" reaction I think At 30mins in Yamasaki again seems to say the wrong word and Endo expands upon it. From about 35mins is the interview. The reporters approach him at a book signing he was doing in Osaka for his new novel "Why I became a rakugo". They show some clips of his rakugo acts. Like Manzai it's mostly talk but without subs there are some funny gestures. Look at him go! 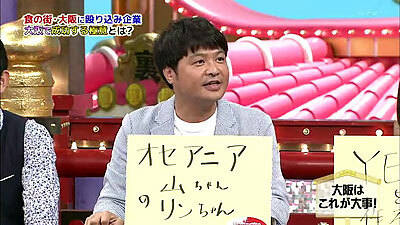 Then whilst riding in a bus Yamasaki (Tsukitei) has to pick a card and answer the question written on it. The first question is about "How much of a fee is paid to performing artists". Yamasaki thinks that'd be too rude but the interviewer insists there's nothing to it. Yamasaki slyly asks if he can talk of Koji Higashino's salary (the host of the Marco Polori show and also someone he is familiar with), he doesn't expect they'll say that's fine and retracts. 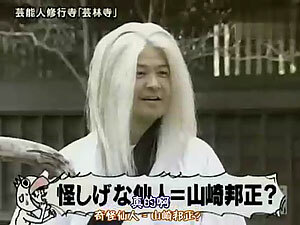 They say even Tsukitei Hakko is fair game to which he seems to answer "as much as comic duo "Shampoo Hat" (シャンプーハットは)". But to confirm anything Yamasaki begins to whisper in the ear of one of the reporters which leads to some accidental intimacy. It's really hazy here but they seem to talk of a detached house worth 100 million yen and more about Shampoo Hat's salary. Question "Least favorite TV talent?". Yamasaki puts the card back down. But they carry on with the question despite the reluctance. Next card "Showbiz "Bomb" Polori". After that he draws the PR card so is allowed to discuss his book. Tsukitei Hosei with fellow rakugo Tsukitei Hakko and Katsura Sando explore Naniwa in Osaka. Hosei-san recently moved from Tokyo to Osaka it seems. Tsukitei Hakko (the guy on the left in the screenshot) is apparently originally based in Osaka but "still not familiar with it". The first part deals with them getting advice from seniors. They're told they have to know where to get good food from to survive in Osaka so they go amongst the many local stalls and little restaurants in search of some different foods to bring back for the senior comedians "seal of approval". As usual Hosei gets roped into trying something extremely spicy! He also makes a choice that some may find familiar from a certain Absolutely Tasty episode. Then they quiz the local "Obachans" on different things. Fun to see them interacting with the public (though wish I knew what the questions/answers were!). Hosei seems to have very bad luck drawing question cards from the box. Tsukitei as the "new rakugo" (aged 45, 26 years in the industry, rakugo work since 2008) from the West (Kansai region) and the senior Yonesuke (ヨネスケ) as the "old rakugo" (aged 65, 47 years in the industry) from the East (Kanto region) travel to different places together whilst occassionally commenting to the camera about each other. There is a very funny bit with a bunch of donkeys at a safari park for example, later they imitate what the animals looked like at the dinner table. The first part is talk then the last part is a quiz. Tsukitei seems to get most the answers wrong, theres even one about President Obama in English I notice when the woman next to him gets it wrong first he looks like he's trying to change his answer but just seems to make it more absurd/wrong judging by the reactions. 13 -03 -03 & 31 Marco Polori マルコポロリ! Talk with guests and such. Discussion about news & other topics. Any new vids from Tsukitei Hosei for the month of April? I manage to find one and I'm gonna share it with everyone. It is Tsukitei Hosei in the show "Drive! Go! Go!" with a member of AKB48. So enjoy! Managed to find a 1080p HD version. 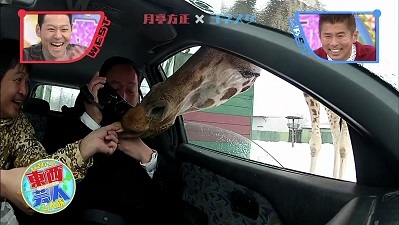 I like the part where he starts singing along to the AKB48 song in the car. Comical talk with female comedian duo 海原やすよともこ. They talk a little bit about themselves and their careers etc. And also make some A or B choices on certain subjects. It would be nice to understand what they're saying but they are pretty funny together due to the physical gestures and such that they use. Japanese synopsis of the talk here (page search for Hosei-san's name 月亭方正). A guest with actor Issei Ishida who he acted with in a 2009 stage play "Shinjuku Midnight Baby" 「新宿ミッドナイトベイビー」. Cultural talk. A curry themed episode I think. There's been other stuff he's been on, but no uploads of them available yet it seems. In this show contestants have to guess who is being truthful and who is lying. Part of it is 2 people telling a story of something they did or found for example that might seem unbelievable, then after the contestants guess they show a video of the one that was true. The other part is a "Reaction" game. Two teams, A and B, are trapped in a box and are subjected to certain things. The contestants must guess who is reacting to the real thing or the fake. Yamasaki is in the reaction game, some of the "true story videos" are entertaining without subs though too. This first show was mostly talk. The topic turns to Yamasaki in the second part after 33 minutes in. He seems to win at the end. Yamasaki is on it throughout as a guest, about 18 minutes in he and another show off the pants they're wearing. Also after 1 hour in, they show a "reaction" segment of him and 2 others being made to do different things. Such as painful massages etc. 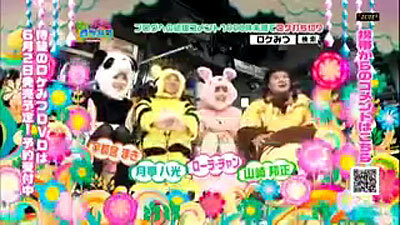 Arashi is a male idol group and on this show they host and particpate in various games with guests. 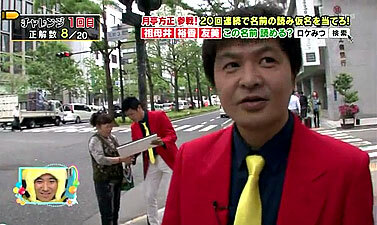 A group of people work as a team against them, and also the Arashi team get "Plus" members on board to help them. 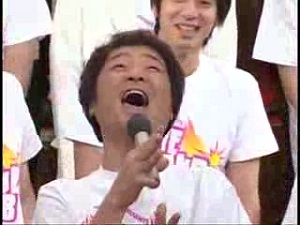 Yamasaki has been on this a few times, either on the VS side or on Arashi's team. There are even subs for some episodes. The games are all physical though so can be understood without subs. Jul. 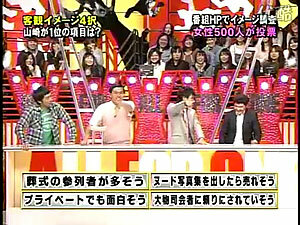 7, 2011 - VS Arashi EP #144 (Arashi + Becky vs. Imada Team). Yamasaki is on the VS team. SUBBED version via very_nadegata LJ group. However it is a manual approval group, so have to wait to get access (think it took 1 week for me). They have a rule against re-posting or hotlinking to their videos. Instructions on how to join in the first link then when granted access the second link is the post with the video. You can get a high quality hardsub at this LiveJournal group, no manual approval so easy to get access (there are still some rules such as no re-uploading elsewhere/streaming/hotlinking/etc.). You'll need to join the group via the top menu (when logged in) on the first link to access the post in the second link. A variety show with challenges and vs matches, talk, travel etc. 2008.06.14 & 06.21 - Seems to have a focus on Yamasaki. They also pull silly faces using green hose pipes like in the picture of Yamasaki used in the Police Station Batsu (for the ID pic given to Endo). 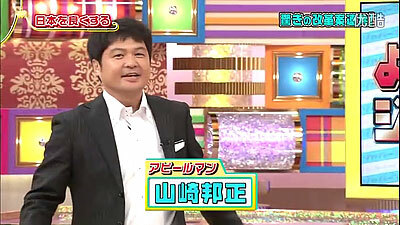 2009.05.11 - Yamasaki appears as a judge co-host in a captain-like uniform on this episode which features various vs game matches. 2010.12.08 - Food focus episode Yamasaki was a contestant on. Each contestant must pick a menu item from a restaurant then talk it up to get voted against the other side's choice. After they have the cook come in and make it for those who voted for it. 2011.02.09 An episode where they visit the family and hometown of a fellow comedian. 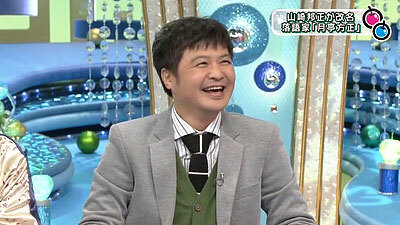 Yamasaki is in the second half visiting the snowy hometown of comedian Suzuki Q Tarou. He also performs a music act. Urban Legends Episodes - Episodes where the focus is telling stories. There seems to be two of these broadcast each year. 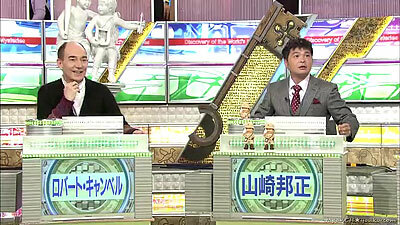 A Deluxe Special (オールスター感謝祭超豪華版) which seems to have challenges and another which seems to mostly be a quiz show. 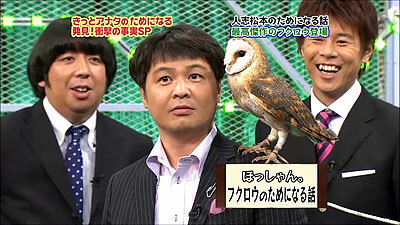 The quiz show is of course not that easy to follow without subs aside from some funny reactions here and there. According to the Wiki article for the show some notable things happened during 2002 and 2006 challenges he was in but I can't seem to find those episodes. Yamasaki and others participate in a ice bowls game using themselves as the stones. 2011 Challenge Show - Yamasaki and others get chosen to be jumped over by a bike, though unfortunately for them first the non-expert show host wants a try. I could be wrong but don't think Yamasaki is chosen to be in one of the games for this one. Variety games show. Chiaki is in the first part then Yamasaki in the second. 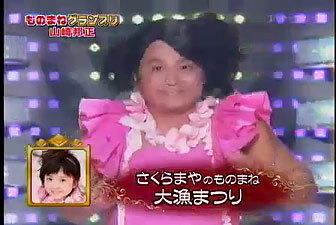 A variety talent show with Yamasaki and others dressed as fairies judging the acts. The acts themselves are entertaining. There is also a running gag with a fellow Yoshimoto comedian who keeps turning up but who they never let through regardless of what he does, definitely check out his animation! Sadly been unable to find many episodes, it'd be great if anyone could track them down. Clips of acts from episodes. Thriller Act. I wish they had clipped more of this episode since it seems to be just after Yamasaki's act. I think between 2003 - 2005 he was a regular on this variety show but haven't been able to track down those episodes, if anyone else can please do share! 2010.06.24 - Talk and highlight clips from previous episodes for each guest. Some funny moments even without subs due to the physical gestures and Yamasaki's fits of laughter. 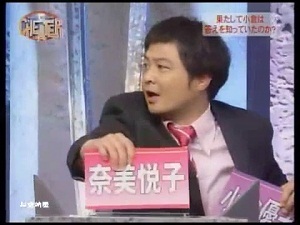 2011.12.30 - Yamasaki is one of the quiz contestants throughout the start of the show. 2012 - Yamasaki faces up against a heavyweight champion. 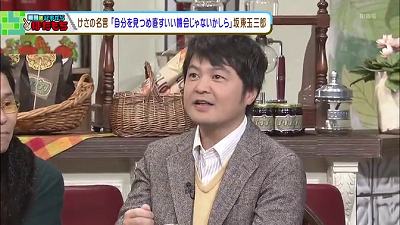 Also around 1 hour 18 mins in is a question relating to him regarding a Yoshimoto stage show. Maybe someone can find earlier years? 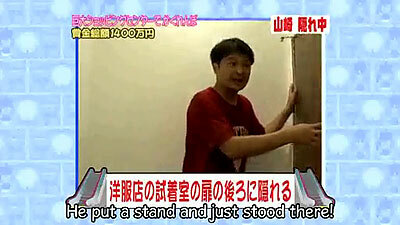 Hoping someone can find the 2010 and 2011 non-special Batsu episodes. Round table games. Wordy but still funny for the faces and gestures plus Yamasaki's cat impression. Though it says membership only you can still download with JDownloader. Late night variety show Yamasaki has been on a few times. 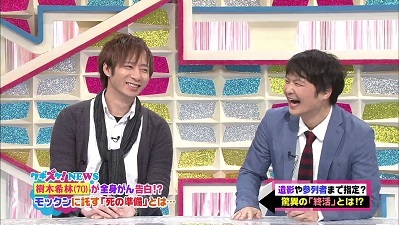 Variety talk show which Hamada co-hosts. 2011.12.07 - Yamasaki is the final guest. Seems to be talking about his experience on Denpa Shonen during the Spanish bull running episode. A show where they seem to bring in guests to talk about times when they legitimately cried. 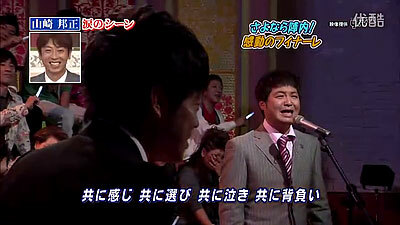 2011.09.08 - They show a clip of him getting emotional whilst singing a tribute song to someone. 2010.06.20 - Yamasaki brings in a pop up pirate game which has some extra features that they play with. 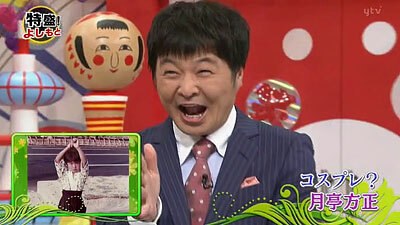 He also talks about his experiences on Denpa Shonen, imitating himself trying to catch the Chupacabra. 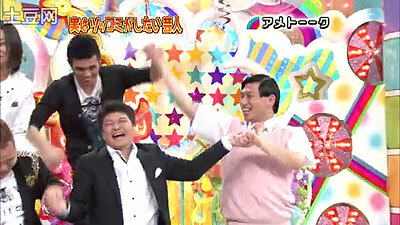 Annual show which many Yoshimoto comedians appear on to do acts. As well as a ranking at the end. Hopefully someone can find earlier years such as 2007 etc. 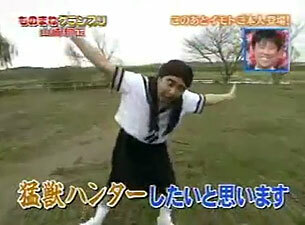 2011 - Yamasaki dances to Kara in the "Sound of Geinin" act. 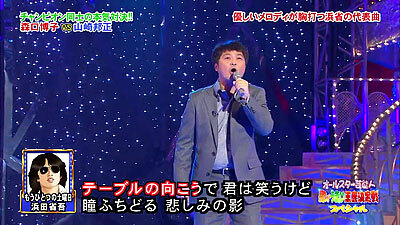 2009 - A version of Yamasaki Ichiban with changed lyrics. Also check out the ranking results at the end (poor Yamasaki). Though it says restricted, JDownloader can grab it. 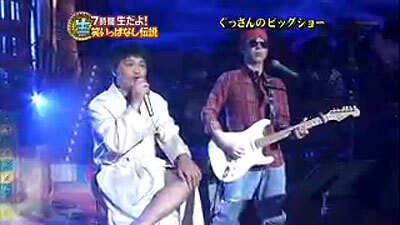 2008 - Yamasaki as Shogo Hamada (or YamaSho as they nickname him) singing alongside Endo I think. 2009.11.06 - At 15 minutes in is a video story with an actor pretending to be Yamasaki. Can anyone understand what the story is saying? My guess is its about him being inspired by a puppy from a show during the early 90s when he was starting his career. He's also chosen at one point for the Kids Survery Derby where they go around to members of the public asking who they would vote against and why. 2009.09.25 - Chosen for the Kid Survey Derby. 010.03.19 - Yamasaki and others travel around Osaka searching for foods for the other show guests to try. He's also chosen for the Kids Survey Derby. 2010.05.07 - About 38 minutes in, Yamasaki chosen to do a headstand. 2010.08.13 - Think he's on this primarily as a talk/discussion guest. 2010.08.20 - Chosen for the Kids Survey Derby. 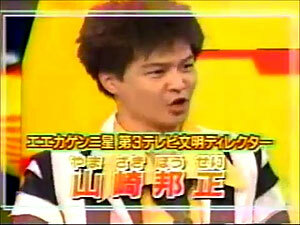 Quiz show with some games which Yamasaki was on in a team with Cocorico representing Gaki no Tsukai. I could be wrong but I think they are mainly there at the start and end but not throughout. 2010.04.10 - About 18 minutes in is some scenes involving a large toy car. Both Yamasaki and Tanaka are picked out to do different things. 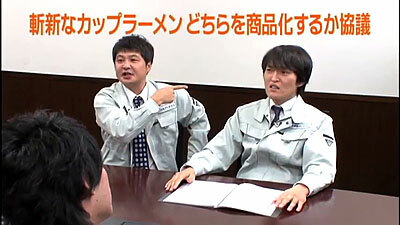 Also in Part 3 Gaki no Tsukai are called on a number of times to state why they gave certain answers, Tanaka does most the talking (they seem to note how close he keeps getting to the mic). Early 1994 - 1995 late night variety show which I think on another show is noted as being part of his "debut" on TV. Involves some talk and then games where Yamasaki and others have to pick a female celebrity guest from the audience to win a challenge for them, such as an eating contest, throwing ink balloons at eachother etc. I think they also have to say why they picked that person. It's late night so there is a mature slant on some things (censored like on Gaki no Tsukai). I also spotted Jimmy Onishi on this, during Part 1 of U.B.U.G.07 (he has to pick a girl from their picture, Yamasaki and others have to guess who he picked. I think they also show some poster art he drew.). Maybe someone can source the other episodes. May of been on it more times as mentioned as a "quasi-regular" on the Omakase Brain Shock (おまかせ!ブレインショック) game. Seems to be a show where lots of celebrities come together and have to answer stuff or do word games? Not sure which years he was on in this. Live Stand 2008 - Hard gay is in this too. Yamasaki is at the very top right (last person). A pretty cool looking karaoke competition between comedians, you may spot other recognisable faces in full episodes (such as Matsuko Deluxe). In the 15th show, he managed to get through all rounds to the finals and won the prize (1 million yen and a BMW car)! Some appearances of his on this show could not be found (check the top of the thread for a full list of them for if anyone can track them down). All Star Show 1st (November 14, 2008) - Got to the 3rd round. 14th show (January 27, 2009) - First round entry. 15th show (May 20, 2009) - Winner! There are high quality torrents for this episode on D-Addicts but no seeders I think So I could only find a low quality one. All Star Show 2nd (October 30, 2009) - Got to the 2nd round. Earlier champions of the show come together and face off against each other. Yamasaki does another rendition of Smoke Gets in Your Eyes in English, but isn't as successful as before with it (I guess they think the pitch is off since the mistakes in English pronunciation seemed the same?). All Star Show 3rd (October 29, 2010) - First round entry. 20th show (August 23, 2011) - First round entry. All Star Show 4th (October 28, 2011) - First round entry. Might be more for this show somewhere with him in? Singing impersonation show which went off air for 12 years and revived in 2012. 2012 Revival Special - He made a small appearance on this within a Yoshimoto team in Block C. Unfortunately didn't get a chance to sing after a Janken vote, another team mate sings and loses. Their reactions after losing are even in English though. He also re-appears a bit later around the Aladdin Friend Like Me song doing the left elbow right elbow move. Song parody show where the lyrics often seemed to be changed for comedic value. Wonder if he did any more on this show? Early 90s music talent act show he co-hosted. Here he is talking to Kaori Mochida who would go on to become the lead singer of Every Little Thing. 2009.01.18 - Koda Kumi Concert Discussion guest. A show where contestants must run around an area and find the right chairs. Other chairs are either simply duds or have pranks and punishments attached. In some places they will need to solve a puzzle or play a game to get to a chair or to receive a clue. Whilst in other places there are "time traps" meant to lead the player away from the game for awhile. It would be awesome if someone could find the 2010.10.25 he become a finalist in. The best I could find is this episode which he isn't a player in but they interview finalists and show brief clips from their episodes. Puzzle and quiz challenge show with physical consequences. 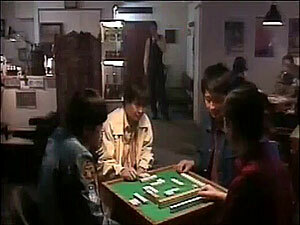 Contestants run around an area and must avoid being captured before the time limit ends whilst also solving puzzles or doing challenges. 2007.04.23 Around an amusement park. 2010.12.11 Samurai town theme and bomb defusing mission in abandoned Hospital with Yamasaki at end. This site here seems to credit him for this episode but I couldnt spot him when scanning through? I think the idea of it is that they are given a phrase and have 1 week to come up with the best punchline they can think of? During the week they visit them once a day to see how they're getting on with the thought process so you see Yamasaki backstage such as when he was on "Laughing Fairy" (listed under Variety in this thread). A show where teams must build a plane and fly it as far as they can off a pier. 2012.08.27 - Yamasaki is a commentator from partway in and also enters a plane with a team. Endo is a commentator and I think a participant on this too. High stakes hide and seek gameshow hosted by Cocorico. A show where contestants are challenged to do various impressions. 2006.05.17 - Yamasaki in costume as the judge host. A show where contestants must guess who got the most on certain things. 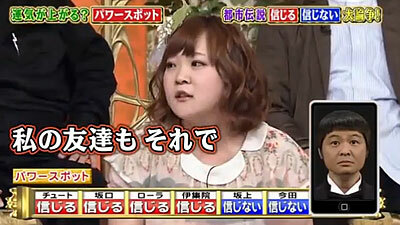 2011.04.10 Yamasaki is one of the contestants trying to guess how others performed in matches. 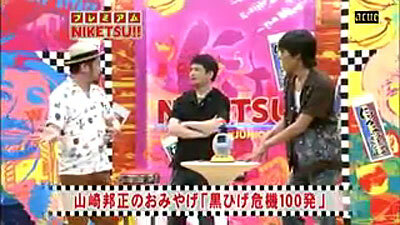 2011.04.12 Particpant in the final match which asks people to guess who got wished Happy Birthday the most. From 1997. This show reminds me of the early 90s British TV show Knightmare! 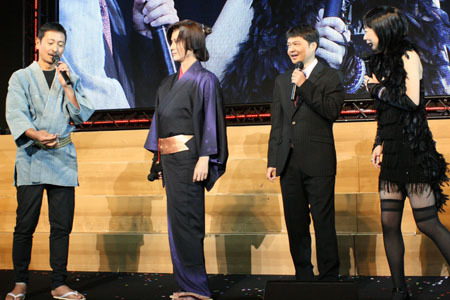 Yamasaki appears as a bonus contestant on one of the teams during part or all of some of the games. There's a bit where he keeps getting hit by a sliding door. Sadly the quality is poor (lots of compression artefacts and it cuts to a grey screen briefly every so often). It'd be awesome if anyone could find Episodes 49 - 52, 59 - 70 and beyond Episode 75 if any. Ghost Girl? - OK I could be totally and utterly wrong but does anyone else think this is him as the ghost girl about 4 minutes in...? If anyone finds any others please do share! What seems to be a early comedy series with a school theme which also starred Jimmy Onishi. Would be cool if anyone could find an actual episode! Some web series involving pretend planning meetings or discussion. Yamasaki was a host in the past on this 90s children's show on TV and stage. Maybe someone can find a full episode from it if there is one. MTK 1999 - Karma Chameleon Music Video - Yamasaki sings, dances and acts. TTK 1998 Ending - Yamasaki singing the theme song and playing baseball with the rest of the cast. 1998 Introductions - Yamasaki and Risa Stegmayer talking with the cast of kids who each introduce themselves. Yamasaki's costume reminds me of Beetlejuice! 1998 Full Ending Song 【天てれED】 (Google translate: "To you dizzy") - Yamasaki singing with the kids. Clip with a focus on Yamasaki (after the kids singing). Ending sing song (he is in the middle). The other clips however are bad quality but better than nothing I guess. Jump The Line Music Video - About them preparing another stage show. You can play spot the Yamasaki with this one. A show hosted by a child star. 2011.07.03 - The kids produce a film (with a talking dog) and quiz the guests on it while they watch. They also all do a "MoriMori" dance at the end. 2011.12.27 - Yamasaki as a guest guide leading to the piano section. Endo is also on this in the ping pong section. 2012.2.12 - Yukimi Hokkaido hot spring - The person he's with does impressions such as a Rola one. 2012.5.13 - Famous hot springs around World Heritage Kumano - Nanki Shirahama. 2012.07.01 - Yamasaki is a guest and at this point it seems he was soon expecting an addition to his family in September (I think he writes about the birth of his son on his blog here), so they look for products for the event. There is a running gag that they keep getting engrossed in their own shopping and start ignoring him. Could only find a low quality version. A show where they seem to visit a celebrity and surprise them with things from their past or bring in guests that know them. 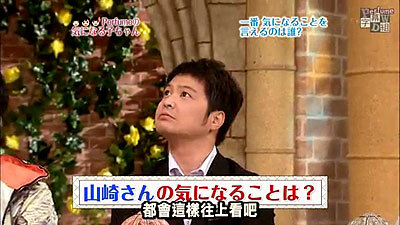 2011.05.15 - Yamasaki appears as a guest in the last half. They talk about conversations they had and other things. There is also a bit of a surprise after Yamasaki starts arguing with someone. Says Members Only but Jdownloader will still grab it. 2011.07.31 - Episode for the lead singer of Every Little Thing. 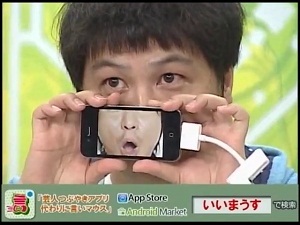 Yamasaki is the surprise video message. 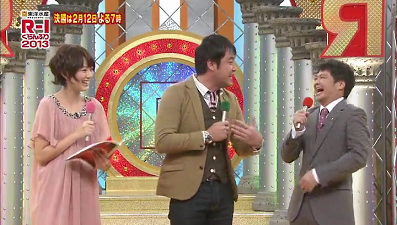 He talks about when she was on a music talent show called BUTA which he was a host on at the time. You can find "BUTA" related stuff under the Music section above. 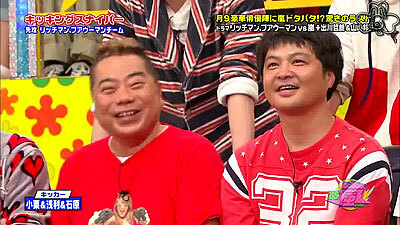 2012.05.07 - Yamasaki and others watch and react/comment on clips from foreign TV shows dubbed in Japanese such as Fear Factor and Try Before You Die. At the end is a little challenge trying to get up a slippery slope (to be honest at first I thought they were going to emulate the stunts in the shows). 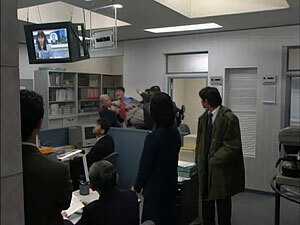 2010.05.13 - Yamasaki (dressed as a monkey on the right) and others react and commentate to the work of a couple of video bloggers. First a guy who is trying to set up a long series of dominoes in a room that contains a monkey, dog and chicken. Then a girl travelling across Japan whilst cosplaying as Asuka Langley from the Evangelion anime, her allowed budget depends on the roll of a dice. Very low quality video unfortunately. Reactions and comments to videos that are surprising or shocking. A series parodying Who Wants To Be a Millionaire except they bring in guests by surprise and the questions I think reveal personal information about them. Contestants have to guess what song they are hearing. 2009.03.03 - Yamasaki on a team with Chiaki and others. Can't seem to find the March 4, 2010 episode he was in. Cultural quiz show he's been on a number of times. 2012.09.27 - Endo is also on this one. Likely more on Youku & Pandora. 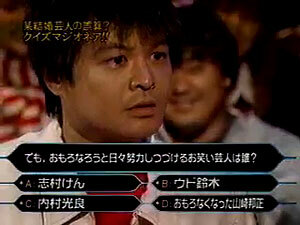 Quiz show hosted by music group Perfume. Cultural quiz show he's been on a lot. Likely many more on Youku & Pandora. Wordplay challenges etc. quiz gameshow. Cultural quiz gameshow with some variety (food tasting and a surprise boxing match for Yamasaki). 2012.11.17 - Surprise boxing match episode. Quiz show where one contestant, The Cheater, is privy to the correct answers each round, and must elude being found and voted out by others suspicion. Short clip where the one being voted out suddenly starts crying, Yamasaki in shock tries to change his vote from her. 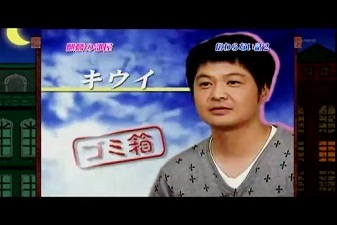 2011.07.30 - Yamasaki is one of the guests. They reveal a early photo of him as a model. He also seems to perhaps talk about his first meeting with Downtown? They also seem to show a video he filmed of kids drawings and other pictures in his house? Then a video he made of him with his dance teacher. They get him to do the dance from the video in the studio. 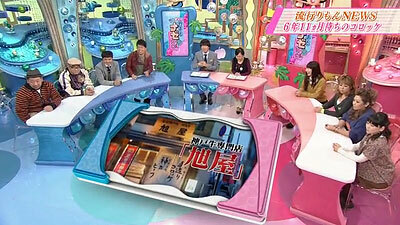 A show where they bring in Japanese speaking foreigners and some Japanese panelists for cultural discussion. Cameramen go to different parts of the world and ask questions to random members of the public and the in-studio guests exchange talks on the topics. They also pose them some challenges such as how to write certain things in Japanese. It is mostly talking but the exchanges often seem to get visibly dramatic in a comedic way so still entertaining, I think one of them even says "Yamasaki Out!". Yamasaki is a regular on this ongoing show. Mostly talk with different people though sometimes there is some variety such as an IQ quiz etc. There are also some on-site reporter segments with different people and I believe Yamasaki has occasionally done some of that as there are pics of him interviewing a little girl (couldn't find the episode though). Also some gag acts here and there such as at the end of episode 2012.06.03. Links to episodes posted regularly on this Japanese video directory site (click on the little ≫続きを視聴する link for an episode article to access a page with embeds and video site links). 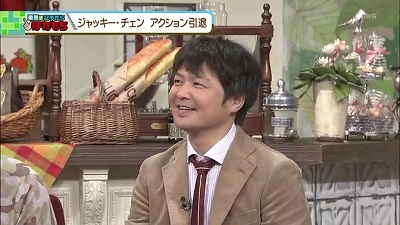 2011.12.03 - Yamasaki as a guest. Shows some pages from his "Miracle" photobook. They also try some cooking which creates some incidents. 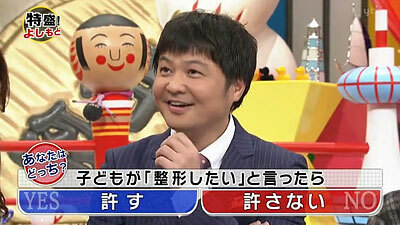 A talk show which Yamasaki has been on a number of times alongside his Rakugo master. 2009.10.13 - Various discussion. 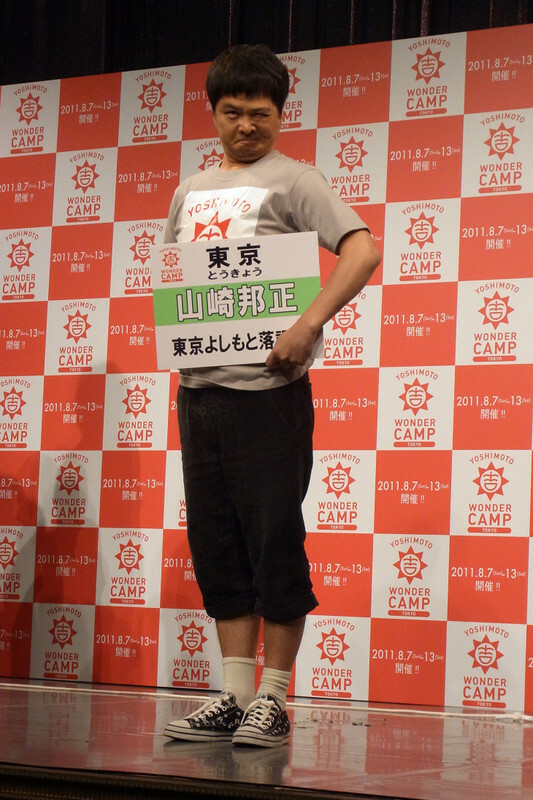 During one topic Yamasaki shows off his jean pants. Appeared as one of the weekly hosts. A guest on a ranking stories segment. 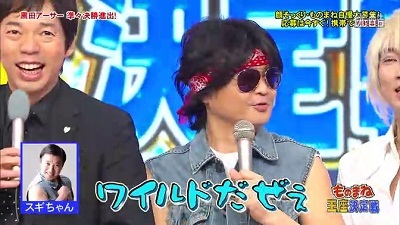 Matsumoto's stories and talk show which he's been on a number of times. You can also find lower quality versions on the youtubeowaraitv site. A clip from an early interview Yamasaki did for one of his books (うさぎ・邦正の人生バラ色相談所―苦悩の泥沼にハマッてしまった人へ). I believe someone in the audience says something that is surprising and they are later replaced by a bear. Yamasaki later talks about this being a notable incident in the All For One quiz show with cartoon impressions. A show where they bring in various guests without prior knowledge they'll be on the show and have them try some exercises. 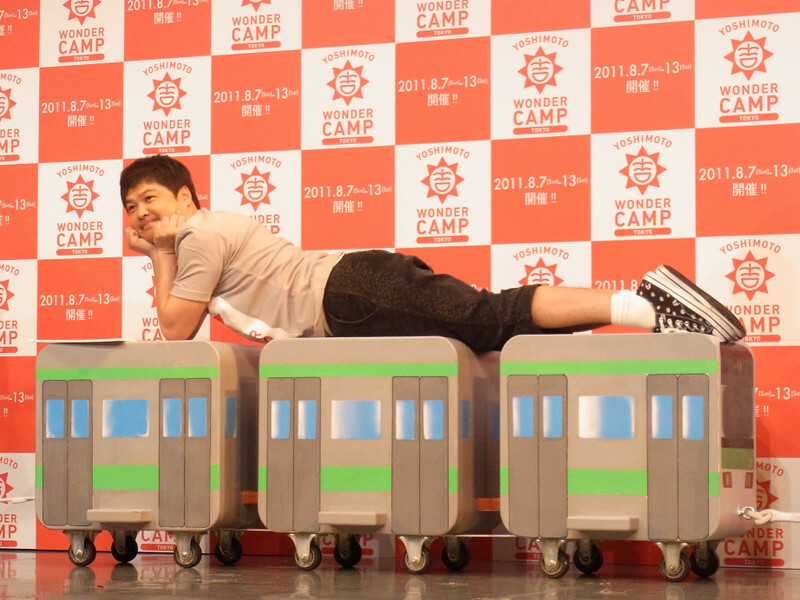 Then they get to choose a set of the exercises they tried for members of AKB48 to do. 2011.02.06 - Yamasaki is a surprise guest about 19 minutes in. 2010.08.03 - Yamasaki is brought in as a surprise Kendo challenger. 2011.01.04 - Yamasaki doesn't do a match I think but appears as one of the supporters. Variety sports. I think Yamasaki and others were brought in repeatedly to face up against the same champion. Had to play spot the Yamasaki in this one since he is credited for being in it. Correct me if I'm wrong but I am pretty sure this is him in the background as one of the various people being dragged into the police station (and then making noise in the background). 2002 - Episode 6 - Could only find a version with odd sound issues and some video encoder watermaking here and there. Maybe someone can find a better source. The whole thing is 2 hours long so here is just his parts that I could spot clipped together. Appeared as one of the visiting players. Brief appearance at the start as an over enthusiastic policeman. On Itao's drama series as a murder victim. 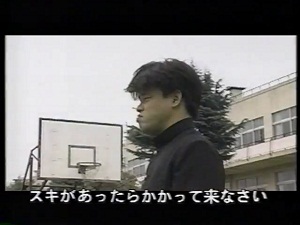 Yamasaki as a crooked boxing coach. Supposedly he's a spectator during the "cat fight" match? Apparently he was the voice of Chucky on Version 2 of the dub (日本語版2). I found a couple of video clips of Yamasaki with others doing a special video recording for the internet radio station he's on. They seem to be talking about the DVD and book for "Neko Taxi The Movie (2010)". Mostly talking but there's some cute cat pictures and one of the props falls down at one point. 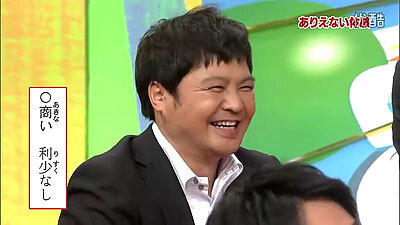 Group photos of him and the other radio casters on Google images if you search "山崎邦正おしゃべりやってまーす". ＃1002 - One of the cooks at a restaurant. Starts off in cosplay. Has some dances and other physical gags. #1003 - Yamasaki as an old man. He may of been on other shows. 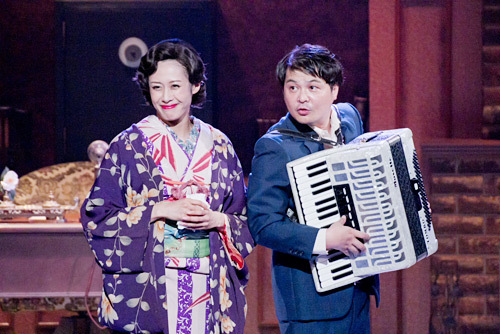 For example he was for sure on the Yoshimoto 100 Years Story Anniversary Show (吉本興業創業100周年記念公演　吉本百年物語) with an accordion. If anyone finds any more stage show clips please do share! But haven't been able to find much video. Please do share if you find any! Yamasaki as a Superhero - Clips from Youtube. 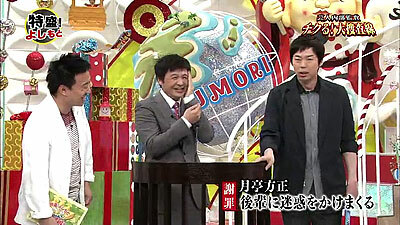 R-1 is a comedy act competition show which in 2013 Yamasaki was one of the co-hosts for. It's a spinoff from M-1 Grand Prix which focused on Manzai acts, R-1 seems to cover acts in general. Candid Photos of Yamasaki taken with members of the public or by other entertainers. Yamasaki interrupting the end of a couple of Georgia Coffee ads. Enjoy! Please do share if you find any of the missing stuff or anything else not covered! Last edited by soudou on 18.02.2014, 17:38, edited 5 times in total. The end of the month Kansai region rakugo stuff doesn't seem to of appeared online so far. Gonna post a roundup anyways. 13 - 04 - 27 Tokumori! Tsukitei is put on a mock trial and has some stories revealed about him (one seems to include Tanaka? 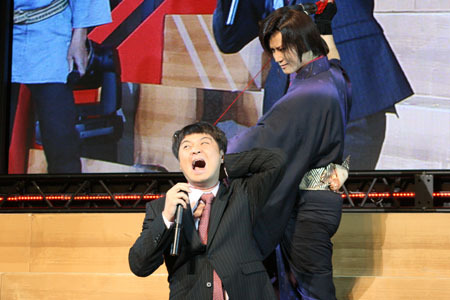 ), then he is made to apologise, which he doesn't take very seriously and to which the hosts don't take kindly, well mainly Imada Koji who has known him a long time so he feels free to treat him badly. He wasn't actually on this one, but it's notable because a student fortune teller told of how there is a rumour going around young women that if you keep a photo of Hosei on your phone for a month then you'll get a boyfriend... On Twitter people started posting pictures of their phones with a picture of him on the screen (with the variety of funny faces he pulls, it looks amusing). I think Tsukitei talks about the kinds of things one of his daughters says and an experience on a train with a fan (just guessing though). Its a shame 2013/5/12 アッコにおまかせ doesn't seem to of been uploaded because it seems like he got a slap to the face in this one (image thanks to pooleden on Twitter). NMB48 member 谷里歩 (Kotani Riho) and Tsukitei Hōsei seemed to of worked together to film a Best of 7 Contest. Such as trying to traverse an obstacle course whilst wearing binoculars that mess up your perspective. NMB48's new album will be released on June 19, 2013. I think it is some kind of bonus on the DVD or something. Drive! A Go! Go! Airdate to be announced. A trip to the Akita prefecture with 松嶋初音 (Hatsune Matsushima). Image thanks to Tsukitei Hosei on Twitter. Because it might be a "get it while it's hot" thing (with it being Youtube and all), posting this now. Last edited by soudou on 02.08.2013, 14:24, edited 1 time in total. Just two shows unfortunately since I already posted the NMB48 thing and all the other stuff like Drive A Go Go! doesn't seem to of appeared online so far, hopefully in the future they'll surface. A series where the segments are filmed out on location. A regular part of the show which seems popular is the girl cosplaying as Asuka Langley who started off crossing Japan and now appears to be traveling across the world. 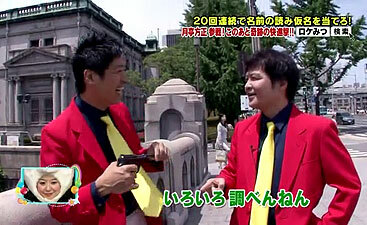 A new segment has started on the show which Tsukitei is co-hosting, they seem to be cosplaying as Lupin. They must travel from point A to point B, but whenever they reach a street crossing, they have to stop. There are about 20 of these to get past. At each one they have to pick out a member of the public and ask them to write down how they would interpret some Kanji. If they guess how they would read and write the Kanji, they get to cross the street. If not they have to start all over again. With one woman, before she has wrote anything down, Tsukitei notes how her dialect had sounded when speaking to them, it seems this kind of difference makes the challenge more tricky. 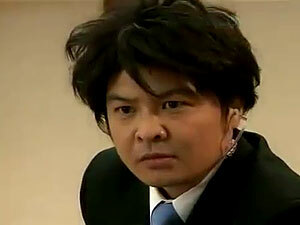 Tsukitei will compete by singing a Shogo Hamada song titled "片想い". On the DailyMotion videos, he's right at the end of the first part, from about 49:55 or so into it. 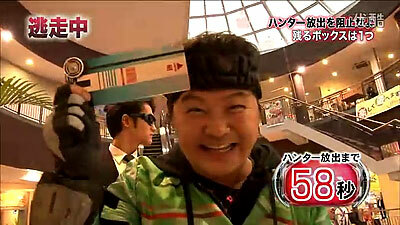 They show a clip of him holding up the trophy from the 15th show which he won in 2009 (1 million yen and a BMW car). Though they also tease him about how he messed up on a more recent episode of the show with a thumbnail of his "oops" face after he finished singing. They also talk about his name change (with some text on screen that says he studied from 2008 and graduated as a rakugo from the start of this year). Haha I think he's also commented on another program that Downtown still keep calling him Yamazaki or Yama-chan (as evident in that recent Famicom Gaki no Tsukai episode when Hamada is distracting him whilst playing and going "Yama-chan!"). [hide]To be honest I guessed how it'd go when I heard he'd chosen a Shogo Hamada song, because it seems he really enjoys doing an over the top impression of him for fun. I think on this show it's more about trying to match the song or emotion, than to do a funny parody. But I did wonder if it'd be different since it seems more of an emotional song. I guess he couldn't resist though. His face at the end was hilarious xD He's all like "Yup " then "ಠ_ಠ" then after he notices the camera is still on him he does that nod with a serious face like "I done good" (even though he knows he's failed because he almost broke into laughter himself when everyone was laughing at him). After the girl finishes her song, it seems the judges are proclaiming her the winner already since Tsukitei comes running on stage sounding indignant. Though he too seems to agree that she did a fantastic impression and that he was shocked at how well she did. Last edited by soudou on 03.08.2013, 23:33, edited 4 times in total.